Southern Belle Camilla Lind, meets her Midwest match in Jared Richardson as she fights to prove she is worthy of redemption, love, and her very own happily ever after. You never forget Camilla is from the south and very proud of it. If the author isn’t outright telling the reader, then Camilla happily fills the void one way or another. Camilla didn’t have far to fall when she slipped from grace, but in the years since committing what she feels is the ultimate betrayal, she’s worked hard to prove she isn’t her past. Which completely explains why she has no time for blue-eyed, breathe stealing cowboy Jared, or repeating any of the mistakes that made her flee her deep southern roots. She has done what she set out to do with her time away from the bayous, and her proper southern upbringing, but now her heart is telling her it’s time to go back. Jared is the ultimate in distractions, but Camilla is desperate to resist his charms. She has too much to lose, or rather too much to gain by walking away sooner than later. In her attempts to help another young woman from making her mistakes, Jared gets her right where he wants her. He courts her proper, pulling from his deep roots. Camilla struggles to believe his motives are pure, but in the end her private thoughts are the real threat to their being together. With Hurricane Katrina barreling down on her beloved homestead in the meantime, all Camilla can think about is what she stands to lose. 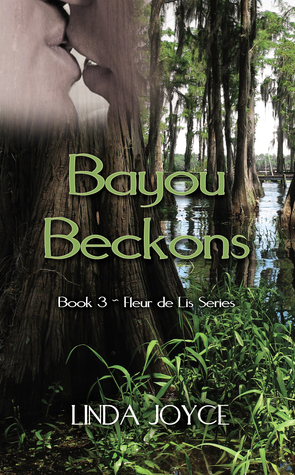 Bayou Beckons is book three from Linda Joyce’s Fleur de Lis Series, and with it comes a new set of complications. Camilla’s internal dialogue as she struggles to believe she’s as far removed from her party girl, no holds barred reputation, is earnest. She knows she’s grown, but isn’t sure it is enough to get her the results she wants. The greater issue comes from her inability to understand that she deserves forgiveness, and moving on with her life doesn’t make her bad person. She’s hardworking, quick on her feet, and has tunnel vision when it comes to moving back home. If only she could get out of her head and realize redemption is a noble thing to seek. Her shame cocoons around her and spoils any thoughts she has about a life without it looming over her head. She’s pretty lucky that Jared is as stubborn as he is handsome. His past has just as powerful a hold on him as Camilla’s has on her, but he knows the real thing when he sees it. The more she pulls away, the more he seeks to show her through chivalry and genuine affection that what they can have together could save them both. Camilla and Jared are the types of lovers I find myself rooting for endlessly. They address their personal struggles in a real fashion. Confusion, optimism, self-doubt, and aching desire to be found worthy muddles the water as they try to determine where they fit into each other lives. Camilla is the more desperate of the two. I love how the author juxtaposed the confident and strong willed exterior with her softer, insecure interior. In true southern belle form, she is all these things at once. Time and again she proves she is fiercely capable of taking care of business whatever that may mean at the time, and then we see the reverse. As she attempts to make heads or tails of what she feels for Jared, she has to also come to terms about how she feels about herself. She’s my favorite kind of heroine, due to her complexity. It is only right that Jared has just as many layers. Except where Camilla is uncertain, Jared has never been surer. He is precisely the type of man who could whether the intricate emotional responsibilities that come with loving an unapologetically southern woman. Linda Joyce is careful to let the characters speak for themselves instead of telling them what to do. Every choice made is unequivocally their own and it shows. Each scene fluidly blends into the next giving the reader more and more insight into the tangled personal webs our hero and heroine have created. They are strong because they’ve had to make hard choices. They are engaging because they seek to show the best parts of themselves while still being honest about their flaws. Most of all, they are human in their reactions and likable. It is completely believable that nearly every piece of dialogue from Camilla is dripping with southern charms and anecdotes. In turn, Jared’s falling for her because of what she represents for him is just as easy to believe. Bayou Beckons is a leisurely and solid read with an intriguing plot. It is interesting enough to rush to the finish, but definitely should be enjoyed on an easy Sunday morning with coffee and comfy pajamas. A leap into Bayou Beckons allows the readers to swim in what happens when fierce loyalty, the capacity to change, and the will to be forgiven collide. It is a true redemption story for all romance lovers to enjoy.